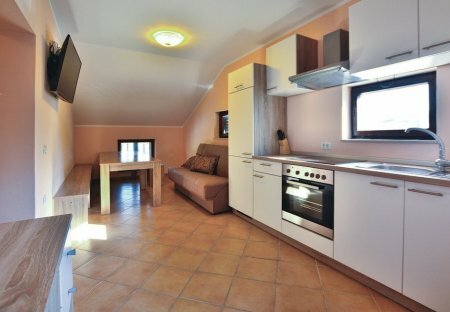 Rent villas and apartments in Sečovlje, Slovenia. This beautifully decorated holiday house with pool is located in Plovanija, a small village near the border with Slovenia. It provides a comfortable stay in the ambience of rustic and modern design. The apartment is situated on the 2nd floor (attic) of a family house. It consists of three bedrooms, bathrooms and a smaller livingroom with a kitchen.